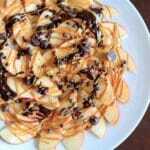 Apple Nachos recipe with peanut butter and chocolate drizzle. Fruit, protein and chocolate makes this a great healthy snack at any time! Vegan, gluten-free, 5 minute dessert. 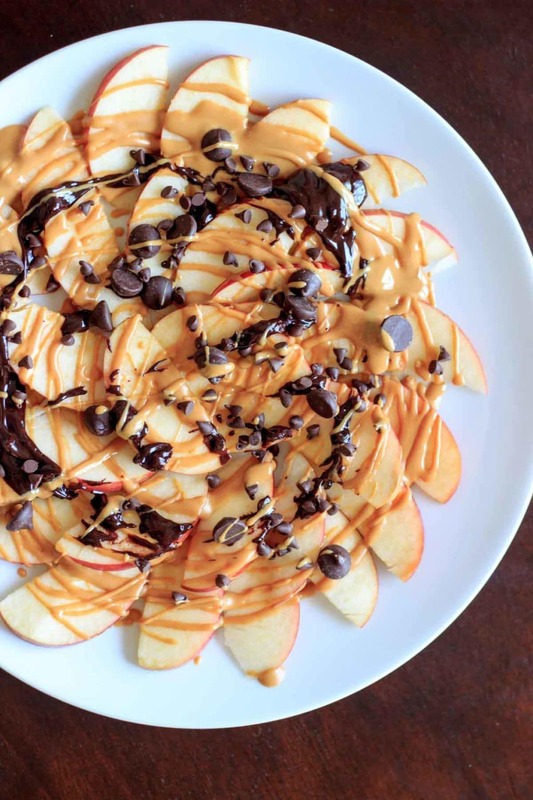 Click here to save this apple nachos with peanut butter and chocolate recipe to Pinterest! One of the best things about pinterest is the inspiration you can find. I especially love when I see a picture of food that makes me feel the need to go make that recipe right that second. It was a pin from this page where I first heard about such a thing, and the options for toppings are endless. 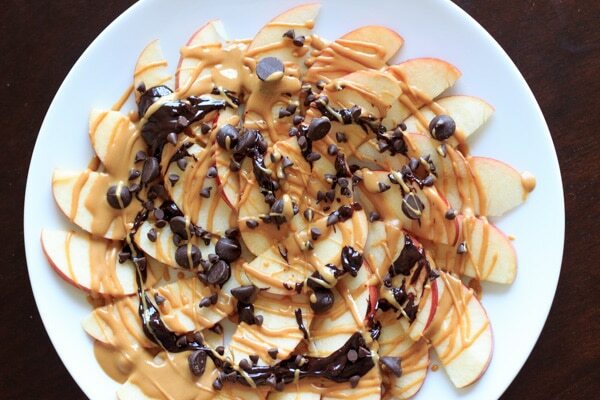 Related recipe: Apple Nachos with Peanut Butter and Jelly! These are not exactly (/at all) like “nachos” since I didn’t melt the whole thing in the microwave, there are no chips and there is no cheese (note to self: try this another time with cheese!). However, apple nachos sounds much more exciting than “apples with various toppings”, so I’m going to go with it. It’s basically a way to get your “apple a day” while satisfying your sweet tooth at the same time. 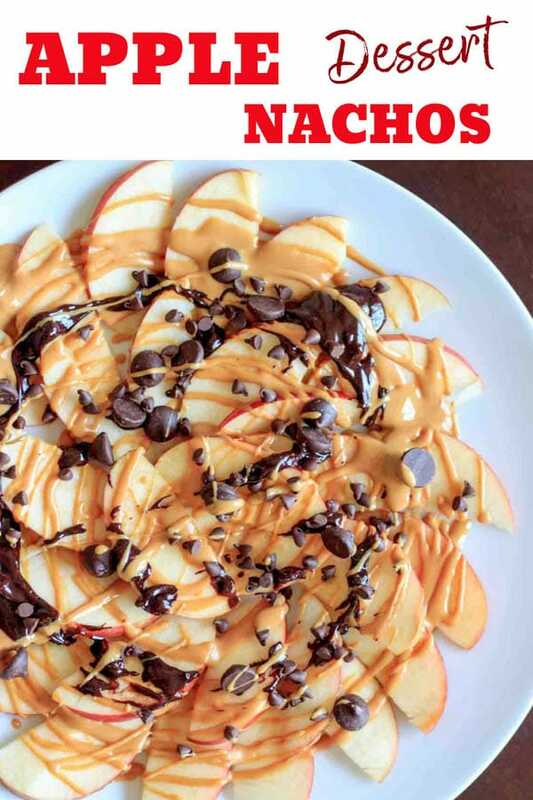 In my searches I have seen caramel apple nachos, toppings like marshmallows and candy bars, but of course for my first try I decided on peanut butter and chocolate apple nachos. Why would I go any other way? This is a totally flexible recipe – you can use any kind of apple you want, any kind of topping and any amount. Many people prefer a granny smith apple but my personal preference is to use a sweet red apple. Though you just can’t go wrong with peanut butter and chocolate. If you are allergic or want a version of apple nachos without peanut butter, other options are almond butter, cashew butter, or sunflower butter. I list the amounts I used for my plate just for a guideline. I used an 8-piece apple corer like this one , cut each piece in half, and then each in half again. 32 thin slices. I melted 1/4 cup of peanut butter in the microwave and drizzled that on, and I tried to do the same with 1/4 cup chocolate chips. The melted chocolate didn’t spread as far as I wanted so I also added chocolate chips (a few mini, and few regular sized) on top. Update: I’ve been informed this is a hit as an appetizer too, but I can’t claim to have shared this with anyone. It’s not often you get a serving of fruit, protein, and chocolate all in one, so this is basically the best dessert snack ever. If you make these apple nachos, take a pic and tag me on instagram with the hashtag #trialandeater so I can find them! I’d love to see your creations. 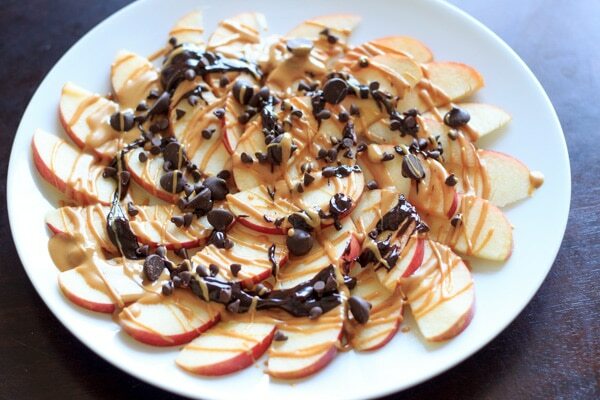 Apple "Nachos" with peanut butter and chocolate drizzle. Fruit, protein and chocolate makes this a great healthy snack at any time! Vegan, gluten-free, 5 minute dessert. Arrange apple slices on a plate. Drizzle melted peanut butter over apple slices with a spoon, and do the same with the melted chocolate. Sprinkle handful of chocolate chips over the plate as topping. I used an 8-piece apple corer, cut each piece in half, and then each in half again. *If you are vegan, double check the labels, as not all brands of dark and semi-sweet chocolate are vegan. **You can reduce the amount of chocolate + peanut butter by half or more if you want to cut down the calories - I just like to overload it sometimes! Click here to pin this apple nachos recipe on pinterest. *There are links within this post that we can earn a commission on at no extra cost to you (known as affiliate links). What a great idea!!! These look delicious! I have made this a lot using peanut butter and Nutella. Delish! I love that these are called apple nachos – that’s so fun! And with chocolate and peanut butter … you just cannot go wrong! I love chocolate and peanut butter together but have never put it on fruit. I’ve always been bad and put it in ice cream, cookies or bars. What a clever (and healthier) way to eat it. You should definitely try it, Maureen! What a beautiful presentation…it looks like a flower!!! And it also looks quite scrumptious! I’ve had plenty of ‘must make this now!’ pintrest moments too 🙂 Love the idea of apple nachos!! I love apples so this sounds amazing! And yours is so pretty too! Thank you Von! Pinterest is the best for inspiration! Pretty sure I would prefer these sweet nachos to any savory version. Can’t go wrong with peanut butter and chocolate! Definitely cannot go wrong with this combo! This is such a great dessert/snack idea! I’m a huge sucker for those enormous apples dipped in chocolate, caramel, etc and coated in nuts (not just a caramel apple, the ones like totallllly coated they sometimes sell in fudge shops). Sounds like a healthier, just as tasty way to get my crazy candy apple fix. Oh yes, those are so good! This is just like that, but not quite as messy. Adding some nuts on here would be another great topping! I made these tonight……..YUMMMMMMM!!!!!!! I used crunchy peanutbutter and chocolate syrup (like for icecream) It was AWESOME! I will be making this again. This is such a clever snack, your presentation is gorgeous. And yes I know what you mean about being inspired after seeing something on-line and then immediately running out to the kitchen. Thank you Cheri! Don’t you love when that happens? I saw this on the Curried Cantaloupe recipe roundup that my Orange Cumin and Chicken Couscous recipe is featured on as well. This looks simply amazing and I love your photography! Who would have thought healthy could be so sweet and tasty. Thank so much for the compliment, Matt! I just love simple healthy snacks that can double as dessert. What a great idea! Looks beautiful and I’m sure it’s delicious! Thanks Ela – it is very delicious! A girl after my own heart – peanut butter should always be in a well-stocked pantry 🙂 I love the combo, I hope you do too! I LOVE apple nachos. One of my favourite snacks. Apple and peanut butter just go so well together, don’t they! I’m only sad I’m late to the party and didn’t discover these sooner! I’m excited to try new topping variations. This looks like the perfect, healthy snack! What a great combination! Thanks Gayle – anything with PB&Chocolate is a winner, amiright? Thank you Emma! I love apple & pb too! Thanks Meredith! I agree, it is a great pair! Thank you Alyssa! That’s what I love about this, these are ingredients that are usually on hand for a quick and tasty snack. I hope you try it! This is the best! I love anything sweet with apples, like caramel or peanuts or chocolate. And this is a nice, easy way to get my fix! Nice pics, too! Thanks Mir! Love this snack, it’s a great pick-me-up! What is your best suggestion for melting peanut butter? I just melt it in the microwave in 20 second increments. Shouldn’t take long. All I can say is amazing. I love it. This is one of my favourite snacks and it’s one of the most popular recipes in my book apparently. Apple and peanut butter just go so well together. This is such a great idea! I’ll have to make it for an afternoon snack with my kids. And about finding inspiration on Pinterest! Totally! We’re renovating soon and I can’t stop pinning! I haven’t heard of apple nachos before, where have I been? Don’t worry, that won’t keep me from diving into this delicious plate of goodness – YUM! Holy over-the-top! I’m such a peanut butter fan, this has my name all over it! Awesome Jessica, so glad to hear it worked on-the-go! Looks so good can’t wait to try it. Great ideas to make different types. I’m going to try Carmel and peanut pieces idea of Carmel Apple.